Anthony Aquan-Assee, M.Ed. 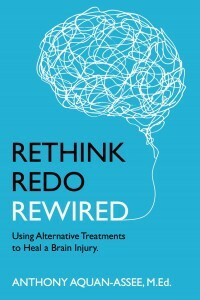 recently presented me with a book titled “Rethink, Redo, Rewired”. The book is an excellent treatise devoted to the course of recovery from a series of major brain injuries. The book describes Anthony’s prolonged struggles to regain his life, along with the many impediments and inappropriate therapies that litter the path to recovery. On pages 65-68, he describes his experience with Laser Therapy, which played the major role in his return to normal health. Personally, I can state unequivocally that all cases of traumatic brain injury treated at our clinic, more than 80% achieve this level of recovery and the remainder are improved in varying degrees. During the year 2016, we treated over 500 cases of traumatic brain injury and this year, our expectations are that we will exceed 800 patients treated at the Meditech Rehabilitation Clinics. The book confirms that Anthony has made a relatively complete recovery from the injuries sustained during the past decade. He is fully functional and once again making contributions to our society in a normal fashion. 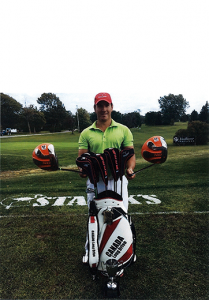 His case is just one example of the numerous patients that we return to a normal health status after struggling for many years in the black void of traumatic brain injury. This entry was posted in Case Profiles on July 21, 2017 by Fred Kahn, M.D, FRCS(C). The patient is a 71-year-old female Ph.D. who presented at our clinic 18 months ago complaining of edema, pain and multiple ulcers of both feet. The lower extremities demonstrated a marked erythematous/cyanotic discolouration that existed at all times. The pain was frequently excruciating and ambulatory activities were minimal. The diagnosis of her condition had been established at age 20 years. Over time, painful nodules developed on the skin of the lower extremities and these would periodically rupture, leading to the formation of recurrent ulcers. Symptoms were aggravated by elevation of ambient temperatures above 19°C. The patient was unable to wear socks, shoes or tolerate any piece of clothing that had prolonged contact with the skin. She was forced to keep the ambient temperature at her home at a constant 20°C in order to be relatively comfortable. She was unable to take walks, particularly during the summer, as she was not able to tolerate elevated temperatures and the resulting induced pain. The formation of multiple ulcers of the lower extremities complicated her condition. Her hands were only minimally to moderately affected and demonstrated mild erythema. The dermal ulcers were most pronounced over the plantar aspects of the feet and sometimes involved the toes and the dorsum also. The patient is a non-smoker and worked as a principal researcher in the field of psychology. Periodically she took Cymbalta (duloxetine) and Lyrica (pregabalin) in titrated dosages. PHYSICAL EXAMINATION: At the time of her initial presentation, both feet were cold to the touch and demonstrated marked tenderness to palpation. Multiple ulcers were noted over the plantar aspects of both feet and some of these showed marginal epithelialization. There was significant acute inflammation over the soles of both feet. A moderate degree of edema, extending to the ankle, was present. The erythematous/cyanotic disolouration was pronounced. Peripheral arterial pulses were within normal limits. TREATMENT: A course of treatment was initiated using the BioFlex Laser Therapy System. This was continued in the office three times per week using the Professional System. Treatment included application to the lumbar spine (autonomic nervous system), and locally in circumferential fashion around the ankles and feet. Appropriate protocols were developed over 2.5 months and these were transferred to a Home Unit for application at the patient’s home two more times each week. The patient was last seen in our office on July 4, 2017. The edema had disappeared completely, along with the sensitivity. Discolouration was minimal. There were a few areas of thickening of the dermis over the plantar aspects of both feet but there was no tenderness and no evidence of ulceration. The patient is now able to walk normally, work in the garden and activity levels are relatively normal. She has some minor sensitivity to temperature changes but she is able to control that to a significant degree. In essence, there has been over 90% overall improvement with regard to both symptoms and physical findings. Prior to the institution of Laser Therapy, numerous medications and other therapies had been utilized, none of which provided any benefit. This case demonstrates what can be achieved utilizing the correct application of Laser Therapy to a compliant patient. Erythromelalgia, also known as Mitchell’s disease, is a rare vascular peripheral pain disorder in which blood vessels, usually in the lower extremities or hands, are episodically blocked (frequently on and off daily), then become hyperemic and inflamed. There is severe burning pain (in the small fiber sensory nerves) and skin redness. The attacks are periodic and are commonly triggered by heat, pressure, mild activity, exertion, insomnia or stress. Erythromelalgia may occur either as a primary or secondary disorder (i.e. a disorder in and of itself or a symptom of another condition). Secondary erythromelalgia can result from small fiber peripheral neuropathy of any cause, polycythemia vera, essential thrombocytosis, hypercholesterolemia, mushroom or mercury poisoning, and some autoimmune disorders. Primary erythromelalgia is caused by mutation of the voltage-gated sodium channel α-subunit gene SCN9A. In 2004 erythromelalgia became the first human disorder in which it has been possible to associate an ion channel mutation with chronic neuropathic pain; when its pathophysiology was initially published in the Journal of Medical Genetics. Primary erythromelalgia may be classified as either familial or sporadic, with the familial form inherited in an autosomal dominant manner. Both of these may be further classified as either juvenile or adult onset. The juvenile onset form occurs prior to age 20 and frequently prior to age 10. While the genetic cause of the juvenile and sporadic adult onset forms is often known, this is not the case for the adult onset familial form. The most prominent symptoms of erythromelalgia are episodes of erythema, swelling, a painful deep-aching of the soft tissue (usually either radiating or shooting) and tenderness, along with a painful burning sensation primarily in the extremities. These symptoms are often symmetric and affect the lower extremities more frequently than the upper extremities. Symptoms may also affect the ears and face. For secondary erythromelalgia, attacks typically precede and are precipitated by the underlying primary condition. For primary erythromelalgia, attacks can last from an hour to months at a time and occur infrequently to frequently with multiple times daily. Common triggers for these episodes are exertion, heating of the affected extremities, and alcohol or caffeine consumption, and any pressure applied to the limbs. In some patients sugar and even melon consumption have also been known to provoke attacks. Many of those with primary erythromelalgia avoid wearing shoes or socks as the heat this generates is known to produce erythromelalgia attacks. Raynaud’s phenomenon often coexists in patients with Erythromelalgia. Symptoms may present gradually and incrementally, sometimes taking years to become intense enough for patients to seek medical care. In other cases symptoms emerge full blown with onset. Primary erythromelalgia is a better understood autosomal dominant disorder. The neuropathological symptoms of primary erythromelalgia arise from hyperexcitability of C-fibers in the dorsal root ganglion. Specifically, nociceptors (neurons responsible for the sensation and conduction of painful stimuli) appear to be the primarily affect neurons in these fibers. This hyperexcitability results in the severe burning pain experienced by patients. While the neuropathological symptoms are a result of hyperexcitability, microvascular alterations in erythromelalgia are due to hypoexcitability. The sympathetic nervous system controls cutaneous vascular tone and altered response of this system to stimuli such as heat likely results in the observed microvascular symptoms. In both cases, these changes in excitability are typically due to mutation of the sodium channel NaV1.7. These differences in excitability alterations between the sympathetic nervous system and nociceptors is due to different expression of sodium channels other than NaV1.7 in them. Erythromelalgia is a difficult condition to diagnose as there are no specific tests available. However, reduced capillary density has been observed microscopically during flaring; and reduced capillary perfusion is noted in the patient. Another test that can be done is to have the patient elevate their legs, and note the reversal (from red to pale) in skin color. Tests done at universities include quantitative sensory nerve testing, laser evoked potentials, sweat testing and epidermal sensory nerve fiber density test (which is an objective test for small fiber sensory neuropathy). Due the aforementioned factors, patients may face delays in diagnosis. Some diseases present with symptoms similar to erythromelalgia. Complex regional pain syndrome (CRPS), for instance, presents with severe burning pain and redness except these symptoms are often unilateral (versus symmetric) and may be proximal instead of purely or primarily distal. Furthermore, attacks triggered by heat and resolved by cooling are less common with CRPS. Primary erythromelalgia management is symptomatic, i.e. treating painful symptoms only. Specific management tactics include avoidance of attack triggers such as: heat, change in temperature, exercise or over exertion, alcohol and spicy foods. This list is by no means comprehensive as there are many triggers to set off a ‘flaring’ episode that are inexplicable. Whilst a cool environment is helpful in keeping the symptoms in control, the use of cold water baths is strongly discouraged. In pursuit of added relief sufferers can inadvertently cause tissue damage or death, i.e. necrosis. See comments at the end of the preceding paragraph regarding possible effectiveness of plastic food storage bags to avoid/reduce negative effects of submersion in cold water baths. One clinical study has demonstrated the efficacy of IV lidocaine or oral mexilitine, though it should be noted that differences between the primary and secondary forms were not studied. Another trial has shown promise for misoprostol, while other have shown that gabapentin, venlafaxine and oral magnesium may also be effective, but no further testing was carried out as newer research superseded this combination. Strong anecdotal evidence from EM patients shows that a combination of drugs such as duloxetine and pregabalin is an effective way of reducing the stabbing pains and burning sensation symptoms of erythromelalgia in conjunction with the appropriate analgesia. In some cases, antihistamines may give some relief. Most people with erythromelalgia never go into remission and the symptoms are ever present at some level, whilst others get worse, or the EM is eventually a symptom of another disease such as systemic scleroderma. The patient elected to have treatment with the BioFlex Light Therapy System. The technology is utilized to treat a multitude of conditions that require healing along with the relief of pain and the reduction of inflammation. In addition, Laser Therapy attempts to restore normal cell function. Her condition responded to Light Therapy during which the photons emitted are absorbed by mitochondrial chromophores within the cell. Consequently electron transport, adenosine triphosphate (ATP) nitric oxide release, blood flow, and reactive oxygen species increase and diverse signaling pathways become activated. Stem cells can be activated to permit tissue repair and result in healing. In dermatology, Laser Therapy has beneficial effects on scarring, burns, and other damage to the dermis. Furthermore, Laser Therapy can reduce ultraviolet damage both on a preventative and therapeutic basis. In pigmentation disorders such as vitiligo, Laser Therapy can increase pigmentation by stimulating melanocyte proliferation and reduce deep pigmentation by inhibiting autoimmunity. Inflammatory diseases such as psoriasis and acne can also be helped to a significant degree. The non-invasive nature and almost complete absence of side-effects encourage therapeutic benefits in dermatological practice. Laser therapy has also been shown to reduce inflammation and edema, induce analgesia, and promote healing in a range of musculoskeletal pathologies. The peripheral nerve endings of nociceptors, consisting of the thinly myelinated A∂ and unmyelinated, slow-conducting C fibers, lie within the epidermis. This complex network transduces noxious stimuli into action potentials. Moreover these nerve endings are very superficial in nature and thus are easily within the penetration depths of the wavelengths used in Laser therapy. The cell bodies of neurons lie within the dorsal nerve root ganglion, but the elongated cytoplasm (axons) of the neurons extends from the cell body to the bare nerve endings in the surface of the skin. The direct effect of Laser therapy are initially at the level of the epidermal neural network, but the effects move to nerves in subcutaneous tissues, sympathetic ganglia, and the neuromuscular junctions within muscles and nerve trunks. Laser therapy applied with a sufficient level of intensity causes an inhibition of action potentials where there is an approximately 30% neural blockade within 10 to 20 minutes of application, and which is reversed within about 24 hours. The laser application to a peripheral nerve does have a cascade effect whereby there is suppressed synaptic activity in second order neurons so that cortical areas of the pain matrix would not be activated. Adenosine triphosphate (ATP) is the source of energy for all cells, and in neurons this ATP is synthesized by mitochondria while they are located in the dorsal root ganglion. These mitochondria are then transported along the cytoskeleton of the nerve by a monorail system of molecular motors. Laser therapy acts like an anesthetic agent, in that both Laser therapy and anesthetics have been shown to temporally disrupt the cytoskeleton for a matter of hours as evidenced by formation of reversible varicosities or beading along the axons, which in turn cause mitochondria to “pile up” where the cytoskeleton is disrupted. The exact mechanism for this effect is unknown but it is not a thermal action. It has been shown that Laser therapy at the correct dose decreases mitochondrial membrane potential (MMP) in DRG neurons and that ATP production is then reduced so perhaps the lack of ATP could be cause of this neural blockade. The most immediate effect of nociceptor blockade is pain relief which occurs in a few minutes and has been shown by the timed onset of a conduction blockade in somatosensory-evoked potentials (SSEPs). This inhibition of peripheral sensitization not only lowers the activation threshold of nerves but also decreases the release of pro inflammatory neuropeptides (i.e. substance P and CGRP). In persistent pain disorders this reduction of tonic input to activated nociceptors and their synaptic connections, leads to a long-term down-regulation of second-order neurons. The modulation of neurotransmitters is a further possible mechanism of pain relief, as serotonin and endorphin levels have been shown to increase in animal models and following laser treatment of myofascial pain in patients. Thus Laser therapy can have short, medium and long term effects. Fast acting pain relief occurs within minutes of application, which is a result of a neural blockade of the peripheral and sympathetic nerves and the release of neuromuscular contractions leading to in a reduction of muscle spasms. In the medium term there is a decrease of local edema and a reduction of inflammation within hours to days. The action of Laser therapy in reducing swelling and inflammation has been well established in animal models as well as in clinical trials. The numbers of inflammatory cells has been shown to be reduced in joints injected with protease, in collagen-induced rheumatoid arthritis, and in acute pulmonary inflammation. The expression levels of pro-inflammatory cytokines have been shown to be reduced by Laser therapy in burn wounds, in muscle cryo lesions and in delayed type hypersensitivity. The long term effects of Laser therapy occur within a week or two and can last for months and sometimes years as a result of improved tissue healing. This case profile has demonstrated marked improvement of symptoms since the patient commenced Laser Therapy. There are no lesions existing currently and the toenails of both feet have grown back normally and appear to be healthy. She has a mild degree of discomfort with elevated ambient temperatures but can now tolerate wearing open-toed sandals and is able to engage in most physical activities without discomfort. She continues to use a Home Laser Therapy System periodically and finds this to be a most satisfactory arrangement. This entry was posted in Case Profiles on July 18, 2017 by Fred Kahn, M.D, FRCS(C).